The New Amsterdam Hotel was a seven-story brick and stone residential hotel built in 1901 by "Chewing Gum King" William J. White. It stood on the southwest corner of Euclid Avenue and East 22nd Street until being razed in 1969 to build a Holiday Inn that in turn became CSU's Viking Hall dorm before it was demolished to build the university's new Center for Innovation in Health Professions. The hotel was but a small expression of one of the city's most flamboyant characters. Born in Canada, White came to Cleveland with his parents at age six. He became a candy maker and, around 1880, made his mark as the inventor of modern chewing gum. Earlier gums had been flavored, but White discovered a brilliant new way to keep flavor in gum long enough to make it commercially viable to sell it for other than purported medicinal uses. His first flavor was peppermint, which he learned stayed in the gum longer than any other flavor. Ever the eager salesman, White gave a box of his Yucatan brand gum (made in his factory on Detroit Avenue) to every U.S. congressman. He even sailed to England on his own purpose-built steam yacht and presented his gum to King Edward VII. White was apparently as adept in marketing himself as he was in marketing chewing gum. In the 1890s he became one of Ohio's representatives in Congress, serving from 1893 to 1895. The energetic and versatile White also had his less fortunate experiences. 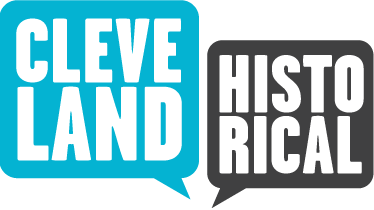 He went broke not once but twice (perhaps the yacht and his 52-room Thornwood mansion on Cleveland's lakefront had something to do with that). Even more unfortunate, in 1923 "the Chewing Gum King" slipped on ice outside his factory. He died not long after. During his lifetime, White also organized the American Chicle Company. White's Yucatan Gum Ad, Ca. 1900s: This fanciful circus scene, which advertised White's most noted creation, was a fitting expression of "the Chewing Gum King's" showmanship. Image by International Sign Co., Cleveland, Ohio, believed to be in the public domain. 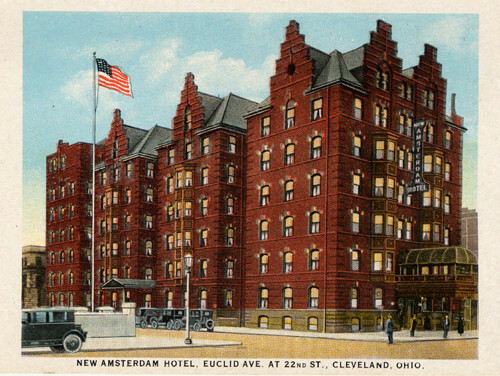 New Amsterdam Hotel Postcard, Ca. 1915: In this early postcard view, the New Amsterdam had "stair step" dormers that were later simplified. Was the change part of some desire to make the Victorian-era hotel appear more streamlined and modern, or possibly an effort to remedy damage? Image courtesy of Cleveland State University Special Collections. 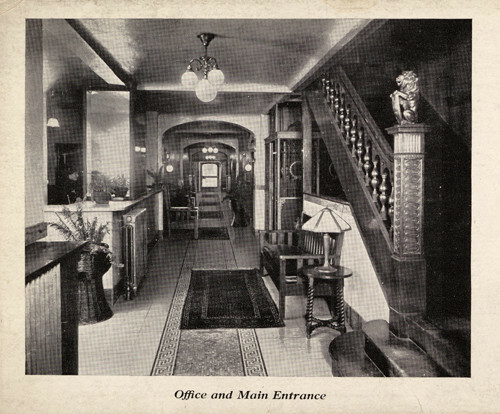 New Amsterdam Hotel Office and Main Entrance: The hotel's lobby featured an elaborate patterned-tile floor and Victorian wood banisters, with a mix of Victorian and Arts and Crafts decor. Image courtesy of Cleveland State University Special Collections. 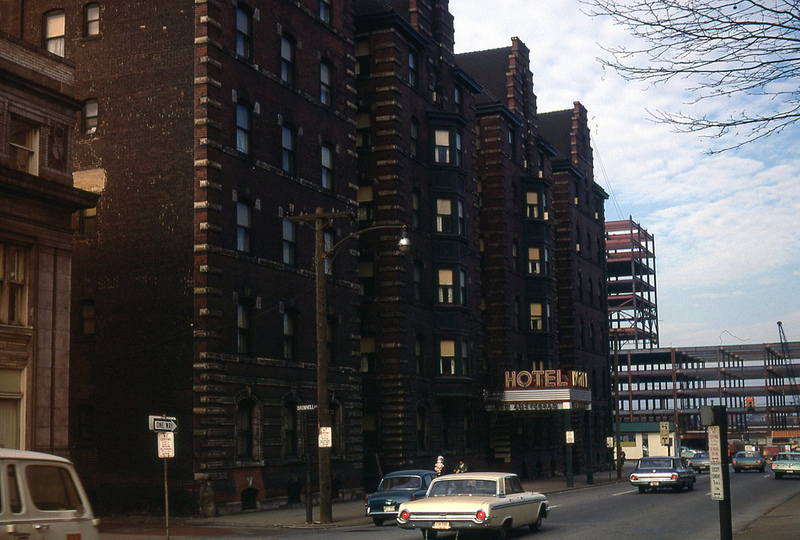 New Amsterdam Hotel, 1965: By the 1960s, the New Amsterdam was showing its age. It stood in the midst of a downtown fringe area then known for its mix of bars, lunch counters, flophouses, and parts supply stores, and was only a block away from Prospect Avenue which was a notorious "skid row" at the time. Image courtesy of Cleveland State University Special Collections. New Amsterdam Hotel, East 22nd Street Side, 1969: Taken just months before the New Amsterdam's demolition, this photo shows CSU's University Tower (later renamed Rhodes Tower) under construction. The university, then only five years old, was already remaking downtown's eastern fringe from a working-class and poor neighborhood with dozens of aging apartment buildings into a Modernist honeycomb of concrete buildings and parking lots that emptied onto freeway ramps. Image Courtesy of Sigmund R. Kobus. Holiday Inn, Ca. 1970: This 13-story motor hotel replaced the New Amsterdam, only to close after a few years. CSU operated the building as a residence hall that housed many members of its athletic teams until it closed in 2010 with the opening of newer, more attractive housing. 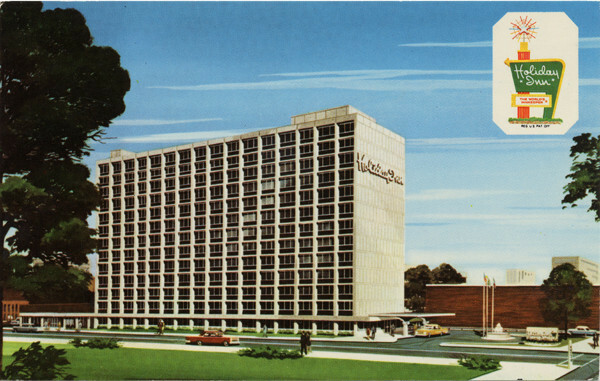 This postcard gives the impression of a suburban hotel surrounded by spacious lawns, but in fact the hotel was sandwiched amid other downtown buildings. Also, the adjacent Trinity Cathedral would have made this particular view of the hotel impossible. Image courtesy of Cleveland State University Special Collections. J. 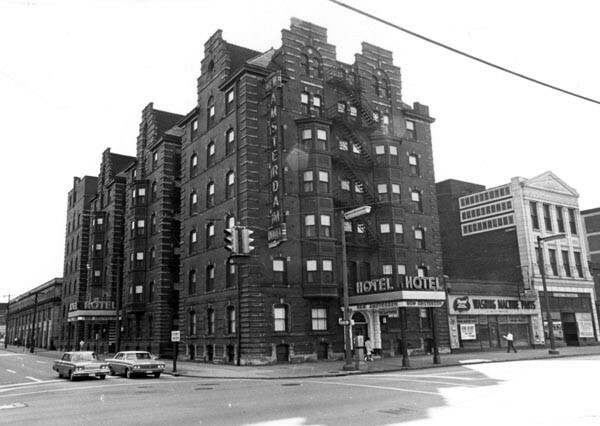 Mark Souther, “New Amsterdam Hotel,” Cleveland Historical, accessed April 18, 2019, https://clevelandhistorical.org/items/show/239. Published on Jun 29, 2011. Last updated on Apr 18, 2017.